A warship is useless without men and women to operate its systems. Though many have served on other carriers no other draft was quite like serving on 'The Mighty Ark'. 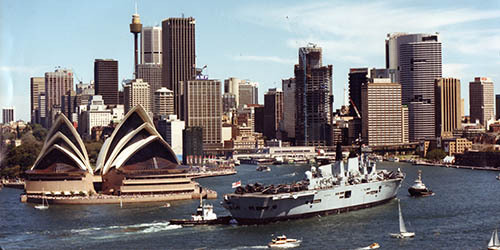 Below is a list of the Ship's Company of HMS Ark Royal in 1988, as published in 'HMS Ark Royal Commission Book February 1987 - December 1988'. As this pre-dates the introduction of women at sea in the Royal Navy, the entire crew are male. S/LT Tindall N.H. S/LT Walsh D.
WO(OPS)M Bird A.D. WORS Hopkins P.C. LT Darbin M.R. LT Humphries P. LT Moss A.D. LT Williams R.C. S/LT Dean M.J. S/LT Lewis D.M.J. WOMEA(H) Cross A.P. WOMEM Davison R.G. WOMEA Howard B.R.J. WOMEA(L) May P.J. CCMEA(M) Dredge G.P. CCMEA(M) Foster V. CCMEA Francis S.P. CCMEA Winton P. CCMEA(M) Williams G.J. LT CDR Chadwick R.R. LT CDR Murch J.D. LT Beverage R. LT Gray D.K. LT Pittard P.M.
CCWEA Bodsworth J.D. CCWEA Moore C.D. LT McLennan R. LT Malcolmson A.D. LT Knight T.P. LT Sutton R.W. WO(AH) Eaton L. WOAEA Elliot G.N. CDR Fish P.A. CDR Yarker T.
LT CDR Kirby W.B. LT CDR Legg M.R. LT CDR Raggett A. LT CDR Wilson C.D. LT Brundle P.R. LT Cannon J.A. LT Robertson D.M. POA(AH) Gulliver S.J. POA(AH) Phillips C.M. POA(PHOT) Rixon K.R. POA(AH) Topliss G.P. SURG CDR (D) Shepherd A.E. SURG LT CDR Hett D.A. MTA3(L) Macey K. POMA Mitchell K.A.W. POMA Walker B.J. LMA(O) Johnson I.C. LMA Jones J. LMA Mather S.R. LT CDR Jellyman P.A. LT CDR Moore G.J. LT Davies C.S. LT Townsend J.J.
LA(MET) Hulford P. LA(MET) Thorne I.
NA(MET) Eyre W. NA(MET) Taylor D.M.S. LT CDR Cole C.M LT CDR Redfearn G.
LT Chapman N.P. LT Henderson R.J. LT Masters J.C. LT Pike M.S. LT Toft B.K. LT Tyler P.
RPO Fawcett P.M. RPO Place N.C.
LREG Matthews E.C. LREG Potts A.W. MID Belpin J.C. MID Boynton S.J. MID Fincher R.C.J. MID Groves C.K. MID Verney P.S.